You are here: Home / Skincare / Skin Condition / It’s Getting Hot in Here: Heat Rash! It’s Getting Hot in Here: Heat Rash! Heat rash is also called prickly heat or miliaria – it is skin condition caused by blocked sweat ducts and trapped sweat beneath the skin causing a mild inflammation or rash. Symptoms range from superficial blisters to deep, red lumps. Some forms of heat rash feel prickly or intensely itchy. It can look like dots or tiny pimples. Heat rash usually clears on its own. Severe forms of heat rash may need medical care, but the best way to relieve symptoms is to cool your skin, prevent sweating, and wear breathable clothing, such as cotton. The mildest form (miliaria crystallina) affects the sweat ducts in the top layer of skin. This form is marked by clear, fluid-filled blisters and bumps (papules) that break easily. Occasionally, the fluid-containing sacs (vesicles) of miliaria rubra become inflamed and pus-filled (pustular). This form is called miliaria pustulosa. Pus is a sign of infection and should be seen by a doctor. Rarer (miliaria profunda) affects the deeper layer of skin. Retained sweat leaks out of the sweat gland into the skin, causing firm, flesh-colored lesions that resemble goose bumps. Obesity or weight loss causing loose skin. 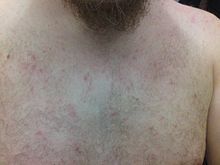 If large areas of your body have skin-on-skin contact (for example, a large overlapping area of abdominal fat or loose skin) then a person is more likely develop heat rash since parts of the skin aren’t exposed to circulating air, which results in the inability of the sweat ducts to “breathe” (evaporative cooling). Immature sweat ducts. A newborn’s sweat ducts aren’t fully developed. They can rupture more easily, trapping perspiration beneath the skin. Heat rash can develop in the first week of life, especially if the infant is being warmed in an incubator, is dressed too warmly or has a fever. Tropical climates. Hot, humid weather can cause you to sweat more and have trouble staying dry. Physical activity. Any activity that causes you to sweat heavily can lead to heat rash. Overheating. Examples: dressing too warmly, sleeping under an electric blanket, even a car seat warmer. Prolonged bed rest. Especially if the person has a fever. « My Autumn 2015 Make Up Color Picks!